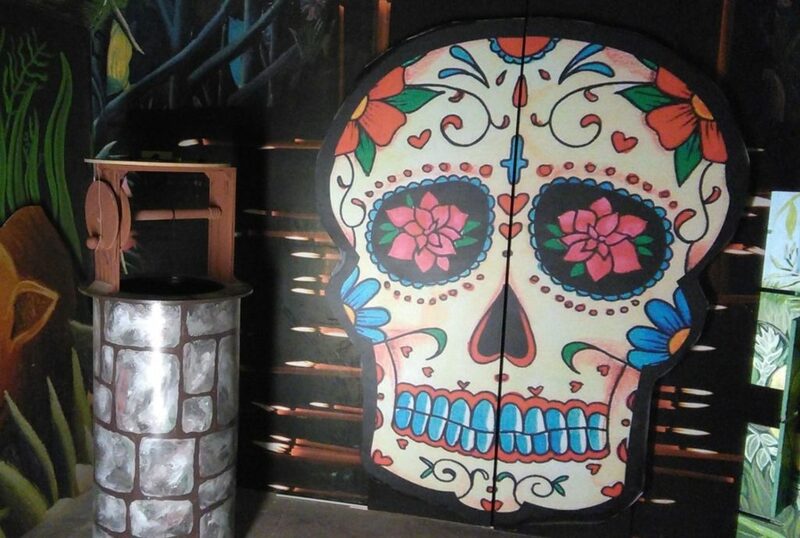 On a previous visit to E-Exit, we’d been lucky enough to play Heaven & Hell, one of the best games in the city, so that, combined with positive opinions from other enthusiasts, had put Santa Muerte firmly at the top of my to do list. It’s worth noting that this game is in a different location from their other experiences, but fortunately (for us!) only a couple of minutes’ walk. Heaven & Hell stood out from the other games at E-Exit in part because there was a significant sense of journey during the experience. The good news is that Santa Muerte follows in its footsteps. In fact, if anything, it’s even more expansive, and you’re almost relentlessly moving forward during the game. That journey may not feel quite as concrete as in their previous room, but it’s still full of bold imagery that helps cement it in my mind far more than most games. While I’d characterise the space as well decorated, there are times where it felt charming in a slightly home-made way. Soon after entering the room, you’ll find your clue and timing system, which fits inside the game world in quite a fun way. It’s very much a backup, though: there’s clear signposting throughout the game that made us reasonably confident about what we were meant to be working on at pretty much every step. In fact, I’m not sure if we even took a clue at all during the experience. If we did, it was certainly only a gentle nudge. Much of the game is linear, so expect to be sticking as a team, but we found that they’d created challenges where that generally worked well. These aren’t easy puzzles, so communication is important, and we often found ourselves gathered round a part of the game discussing how to proceed or working together to solve the task at hand. Of all the games we played in Budapest, this more than any felt like it relied on teamwork. So, the puzzles weren’t easy, but neither were they illogical: once you saw the answer, you always knew it was right, and there was only one challenge where I felt it would have been easy to miss the direction if you were being overly careful with the set. If you pay attention at the venue, then you probably know, more or less, how the experience will end. Even if you don’t, however, the nature of the game means you should expect it to be fairly whimsical, and it absolutely delivers on that. It’s a silly, fun and unusual ending which it absolutely deserves. We played as a three, but two or four would have been similarly fun (I think) although, if you do go as a two, you’ll need to be moving quickly!